All throughout the world, Bilstein are synonymous with high tech engineering in shock absorber technology. Since 1873 Bilstein have become a household name and after entering the motorsport sector in 1961, theyâ€™ve been producing shock absorbers for Formula 1, Rally, Touring Car, Paris Dakar, Le Mans, Nascar – pretty much any motor racing that requires suspension. As part of their continual development, itâ€™s not uncommon for racing teams to approach Bilstein requesting something more custom to suit their vehicles and suspension setup, enter OX4 Racing. OX4 Racing are an established racing team with over 17 years racing experience and over 10 years racing with BMW Mini in various classifications. OX4 Racing contacted Bilstein for a custom-built suspension kit for their Mini Cooper S, their latest entry into the 2014 race calendar. So where do we fit inâ€¦ Bilstein approached us for a promotional video to document the process for the aftermarket division, for social and viral potential, as well as being used for internal use throughout the company. The main objective was to convey the journey from production line, to testing, assembling and eventually to the race track. Scheduling wise the shoot would take 3 days at 3 different locations over the course of 5 months.Â ThisÂ gave us more time in between shoots for detailed planning and prep. An early start for myself and Production Manager Sophia, in order to beat the useless Oxford traffic, to get down to the Mini plant where the teamâ€™s based. We met with Bilstein representative Aaron Quilter, Eibach representative Greg and two of the teamâ€™s five engineers – Chris Fryer and Chris Oakham. After an initial breakdown of the morning shoot (limited shoot time of 3 hours) we got underway. As we were inside in the OX4 garage, weather wasnâ€™t an issue. Lighting was a bit on the dark side but this is where the Canon 5d mkIII really came into itâ€™s own. Combined with the 50mm f1.4 we were able to get some quality footage of the guys assembling the kit and some great beauty shots. â€˜Aâ€™ camera was our 5dmkIII and â€˜Bâ€™ camera was the 550d.Â We recreated the exact process in which they wouldâ€™ve installed the kit along with a couple of staged shots. We embraced theÂ natural sounds of the environment while the team were working (the clanging and rattling of tools, the tightening drill etc) as we wanted to stay away from theÂ polished music video style.Â This raw sound gives a great overall feeling of the garageÂ and surroundings. Because there was a large portion of time in-between shoots, it meant I could get the footage onto the timeline a lot quicker and get a real feel for the edit. From the Oxford rushes, I was able to put together a short teaser. It was in no way reflective of the final edit, but after engaging peopleâ€™s reactions, we kept some of the structure from the teaser which then went on to form part of the final edit. We were outside for the entire day and unfortunately sunshine was not on the agenda. The natural elements seemed to be against us in the form of rain and very heavy wind.Â To add further insult, the OX4 Racing team had broken down on the M1 which added a horrendous delay to the shoot. When the team finally arrived there was no time to lose, we’d lost half a day due to the delay and had to be incredible economic with shot setups. The driver preparation was an integral part that needed to be captured on the day. The suiting up of the helmet and gloves resembled a soldiers armour andÂ I wanted to recreate a raw, natural feeling as if the viewer were actually alongside about to get into the car. I shot with the 50mm handheld. No image stabilisation on this lens, but the rough unstable look coupled with the shallow depth of field creates the subtle metaphor of focus. For in car sound, weâ€™d be using our Zoom H4N duct taped into the back off boot of the Mini (incredibly professional I know) as well as internal audio captured from the GoProâ€™s. We also used our Rode VideoMic Pro for outside audio. 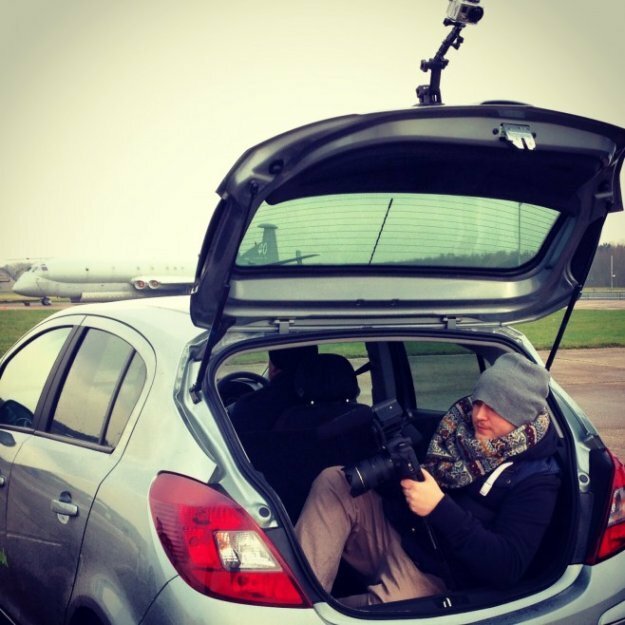 It was the second time that weâ€™d be using our Go Pro Hero 3+â€™s for something car orientated, having completed a recent video for Bruntingthorpe Events. We knew we wanted to cover the car from all angles, both inside and out. We already had our two GoPro Car Suction mounts and purchased the Jaws Flex clamp from GoPro, which meant we were able to get some great angles on the roll cage of the car. For the follow shots in the car, it meant jumping in the boot of the clients (Aaron Quilter) rental car. I was secured in with both belts from the rear and the camera/monopod was secured to myself with cable ties incase I dropped it! By using a nice wide lens, slow drivng pace and extra stability from the monopod, I was able to get some great shots. Towards the end of the day, the weather changed drastically and the sun was starting to shine through the clouds.Â We had an incredible backdrop of the sky, as well as a selection of commercial jets that weâ€™re half torn apart which gave a real industrial look to the frame. Our third and final shoot would take place at the Bilstein plant, not too far away from us in Leicester. A relatively straight forward shoot compared to the previous two, but also one of the most interesting as well. We were taken on a tour of the building and then through the production process of how a shock absorber is produced. We even managed to put the GoProâ€™s to good use again in the testing chamber of a shock absorber. Love those bloody cameras. With a total of just under 180GB of footage from all three shoots, there was a lot to cram into a 2 minute video. From our brief we were filming the journey of production through to race trackÂ and approached the edit slightly different to the processÂ e.g. shock absorber made > fitted to car > race track. By adopting an approach of re-order meant we kept things a little more interesting. In this case the edit actually goes back in time. We start with beauty shots of the car and then through to driver prep and then to the circuit. Weâ€™re then taken on a journey as to how the car has got to the track. The end result is something we are collectively incredibly proud of. From start to finish weâ€™ve loved every part of this production and immensely happy that Bilstein chose us to tell their story.